A lovely spirited folk-rock item from three guys and two girls on an obscure Ohio Christian label. Acoustic guitars, recorder, harpsichord, electric bass, drums, conga, absorbing harmonies and just the right amount of home-made vibes. Jangly acoustic feel includes a good mix of catchy upbeat rhythms and moving meditative ballads, sometimes reminiscent of the early Jack Miffleton and The Group albums. 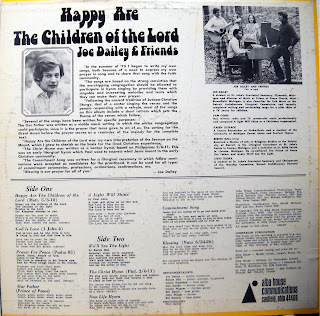 Ten original songs, including ‘God Is Love’, ‘Prayer For Peace’, ‘A Light Will Shine’ and ‘The Christ Hymn’. Alive, authentic, brimming with charm. (The Archivist by Ken Scott, 4th Edition). This are old folkmusic live recordings and the sound quality is not very good. (It seems that sometimes the needle on the record player is jumping). But there is an annointing on this songs and the melodies are beautifull. God spoke to me through this music. Wolfgang, It was a really rough record I hesitated to even record it, hopefully I will find a better copy someday or perhaps someone else has a better recording and can offer it here? There is a sincere and real mood to these songs I like them too!! There is another version of this of this album on this blog that was posted 18 month ago. Maybe the recording quality on this album is better.